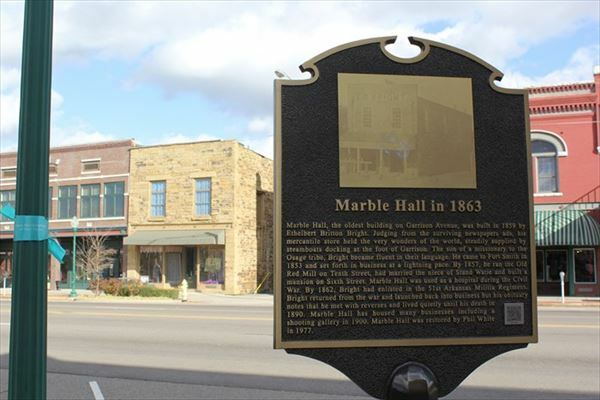 Marble Hall is the oldest building on Garrison Avenue and has a rich history in Fort Smith. It was beautifully renovated in recent years and provides a versatile space for just about any need. Baby showers, wedding showers, birthday parties, office holiday parties, group meetings, family reunions, and much more would be perfect at Marble Hall! For attorneys looking for a bigger space to hold depositions, our board room would be ideal to accommodate many people in one space. The board room is located downstairs and can be closed off from the main lobby. The main lobby also has comfortable seating for any witnesses waiting to testify. Upstairs, we have several round and rectangle tables with chairs that can be moved around. There is also a kitchen and bar area upstairs with a large dining table. We allow you to bring in your own food and alcohol pursuant to the terms and conditions detailed in the contract. If you are needing a space for a meeting, we have a SmartBoard available for use in the upstairs meeting room. If you're interested in booking Marble Hall for your event, please contact us regarding availability. We can also arrange for a tour if you want to see the facility in person. The Junior League of Fort Smith, Inc. is an organization of women committed to promoting voluntarism, developing the potential of women, and improving the communities through the effective action and leadership of trained volunteers. Its purpose is exclusively educational and charitable. Upstairs Occupancy: 146 Downstairs Occupancy: 146 Total Building Occupancy: 292 Rental Fees: Use of the Whole Building: 1 Hour: $100 2 Hours: $150 3 Hours: $200 4 Hours: $250 6 Hours: $300 8 Hours: $350 10 Hours: $400 12 Hours: $450 Use of Downstairs Board Room & Gathering Room: 1 Hour: $50 2 Hours: $75 3 Hours: $100 4 Hours: $125 6 Hours: $150 8 Hours: $175 10 Hours: $200 12 Hours: $225 Use of Upstairs Meeting Room (with Smart Board) & Kitchen: 1 Hour: $50 2 Hours: $75 3 Hours: $100 4 Hours: $125 6 Hours: $150 8 Hours: $175 10 Hours: $200 12 Hours: $225 Deposit: $75, which is refundable within two weeks after the day of the rental if no damages or extra cleaning is required. A deposit is required to secure the rental and a reservation cannot be held until the deposit is paid. Overtime Fee: Any Lessor who remains on the premises or arrives prior to the agreed upon rental times will be subject to an additional hourly rate of $150 outside of that agreed upon by the parties in the Agreement. Any overtime that is less than an hour will be charged $150.